One of the most brutally disappointing aspects of growing up is realizing the Tonka trucks you played with as a child aren’t street-legal. 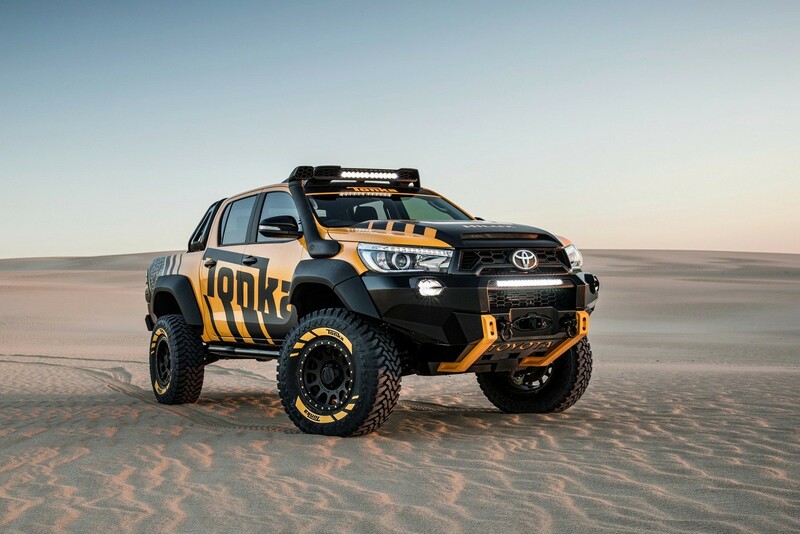 Members of Toyota’s Australian division must feel the same way, because they’ve worked day and night to transform the HiLux pickup truck into a real-life, full-size Tonka that starts and drives. A top-of-the-line HiLux SR5 double-cab — a model not sold in the United States — served as a blank canvas. Parts like the bumpers, the hood, the tailgate, and the wheels were sent back to the parts bin and replaced with new components built specifically for the concept. Notably, the front bumper gets a rugged look that echoes Tonka’s sandpit heroes, while a winch and a beefy alloy skid plate allow the HiLux to soldier on with peace of mind even when the going gets really, really tough. It rides on 35-inch, Tonka-branded tires tucked under wide fender flares, and suspension modifications give it six additional inches of ground clearance. The snorkel attached to the A-pillar isn’t there just for show. Fear not, the body isn’t made out of plastic like the Tonka trucks you used to smash around. However, the tailgate is crafted out of carbon fiber, a material that’s rarely found in the pickup truck segment due to its relative fragility. It incorporates a pair of air vents that improve fuel economy by reducing drag. That’s an innovative solution, but the downside is that you won’t be able to fill up the back with sand. Power is provided by a stock, HiLux-sourced 2.8-liter four-cylinder engine. The turbodiesel generates 174 horsepower and 309 pound-feet of torque, and it transfers its power to all four wheels. We don’t know whether the four is bolted to a manual or an automatic transmission, but we’re going to assume it’s a stick for the sake of fulfilling our childhood fantasies. Toyota stresses the Tonka-inspired HiLux is a concept, and there are no plans to turn it into a production model.